In Library and Archives Canada’s Victoria Cross blog series, we profile Canada’s Victoria Cross recipients on the 100th anniversary of the day they performed heroically in battle, for which they were awarded the Victoria Cross. 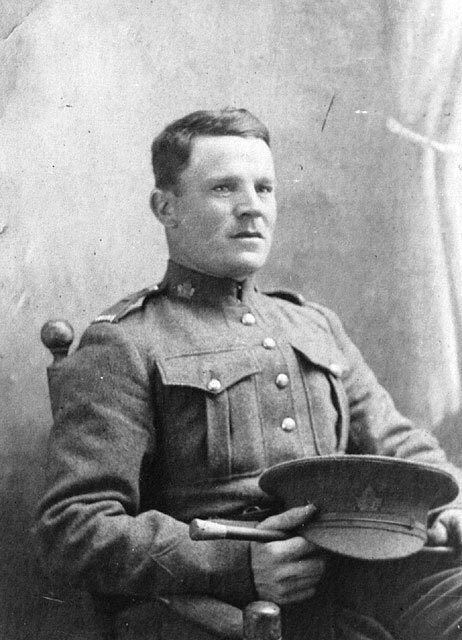 Today, we remember the last Canadian soldier of the First World War to receive the Victoria Cross, Sergeant Hugh Cairns, for his bravery at Valenciennes, France. Born in Ashington, Newcastle upon Tyne, England, on December 4, 1896, Hugh Cairns and his family immigrated to Canada and settled in Saskatoon, Saskatchewan. Cairns was a plumber before the war. Hugh and his older brother Albert Cairns both enlisted on August 2, 1915 and August 11, 1915, respectively, in Saskatoon. They both joined the 65th Battalion of the Canadian Expeditionary Force (CEF), which was absorbed into the 46th Battalion on June 30, 1916 On September 10, 1918, Albert died of head wounds caused by a shell. Hugh Cairns served in France, proving his determination and resilience as a soldier on several occasions. He was awarded the Distinguished Conduct Medal on August 25, 1917 as a private. 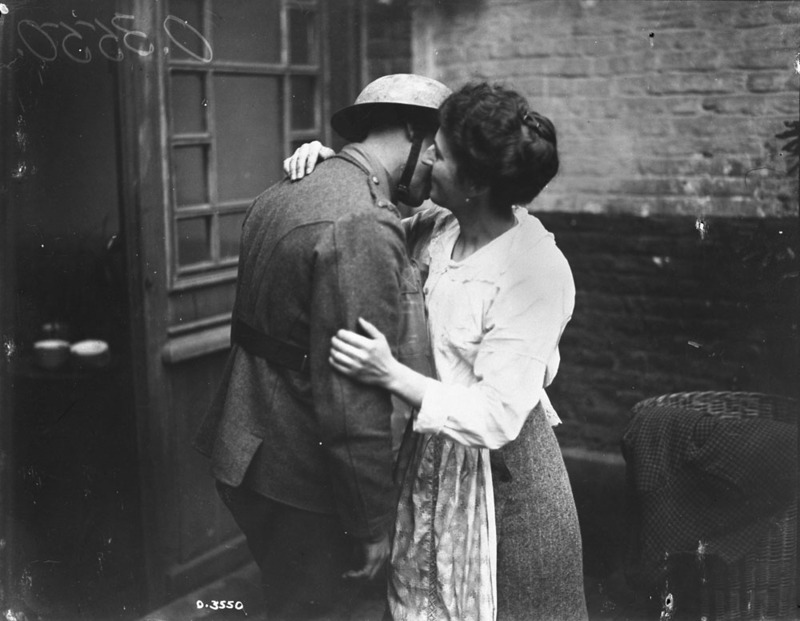 He was promoted to corporal in the summer of 1918, then to sergeant three months later. Through October and into November 1918, the Canadians continued their assault on the German lines. Despite German efforts to stubbornly defend their retreating lines, the Allies’ persistent offensives resulted in heavy German losses, the capture of thousands of prisoners, as well as dozens of kilometres in ground gained. 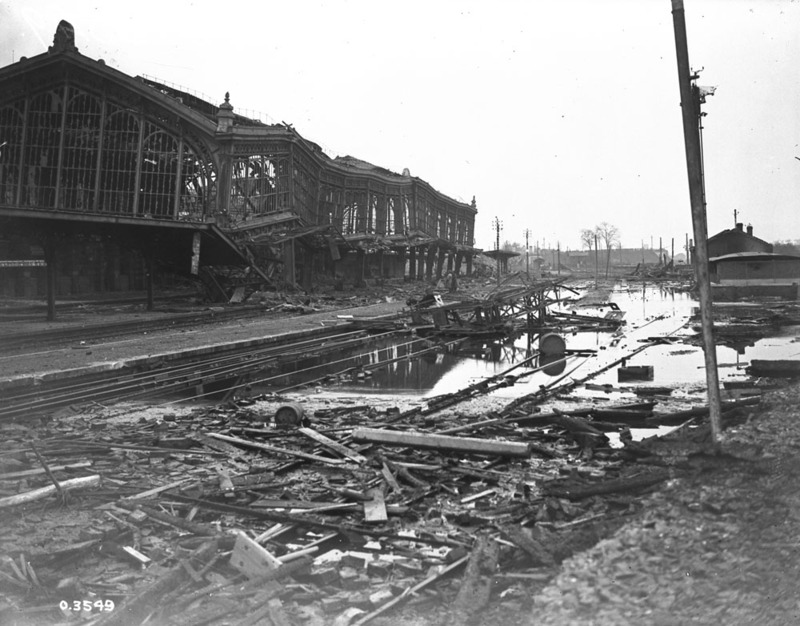 By November 1, 1918, the Germans were clinging to the city of Valenciennes and maintaining their stronghold near Marly. 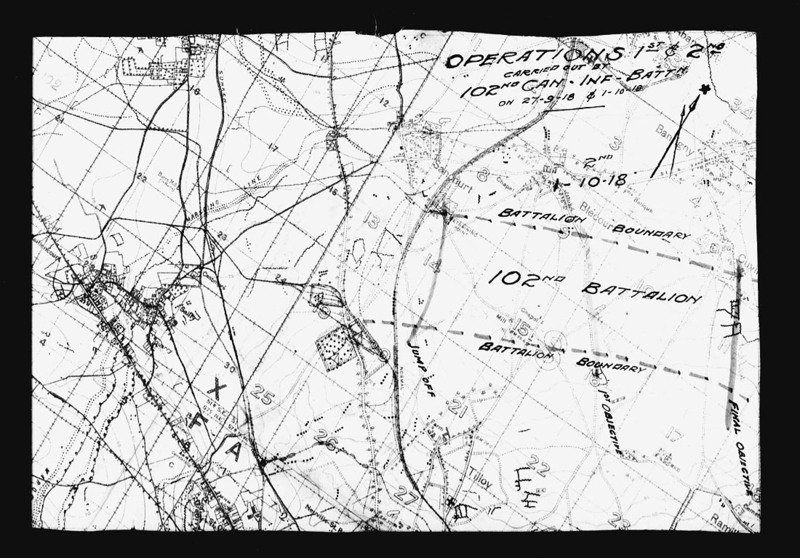 The push into Valenciennes from the 46th Battalion’s “A” Company included an assault on a two-platoon frontage with one support platoon. Cairns was leading the support wave platoon. The Canadian barrage opened at 5:15 a.m. and the platoons began to move toward their objectives. After advancing about 500 yards, they were met with heavy machine gun fire from their left. The platoons pushed on, squashing the resistance from the German machine guns, capturing prisoners and weapons along the way. As the advance inched along, the Company was held up by very heavy machine gun fire. Under a spray of bullets, Cairns and other soldiers moved to outflank the gun. Crawling on their hands and knees, under cover from friendly rapid machine gun fire, the party succeeded in closing in on the battery. 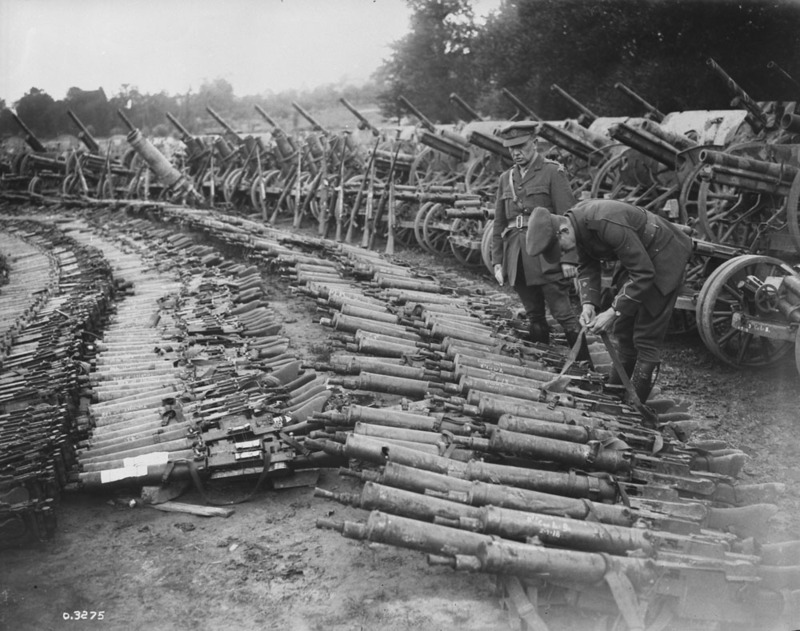 They seized 3 field guns, a trench mortar, 7 machine guns, and over 50 prisoners. Cairns went on to lead his men to capture the railway and establish a post. As Cairns was heading off to examine a nearby factory, a German soldier opened direct fire on him with an automatic rifle from a nearby post. Cairns, wielding a Lewis gun, made a run for the post of German soldiers, and fired. He killed and wounded many German soldiers in his assault as they ran for a nearby courtyard. 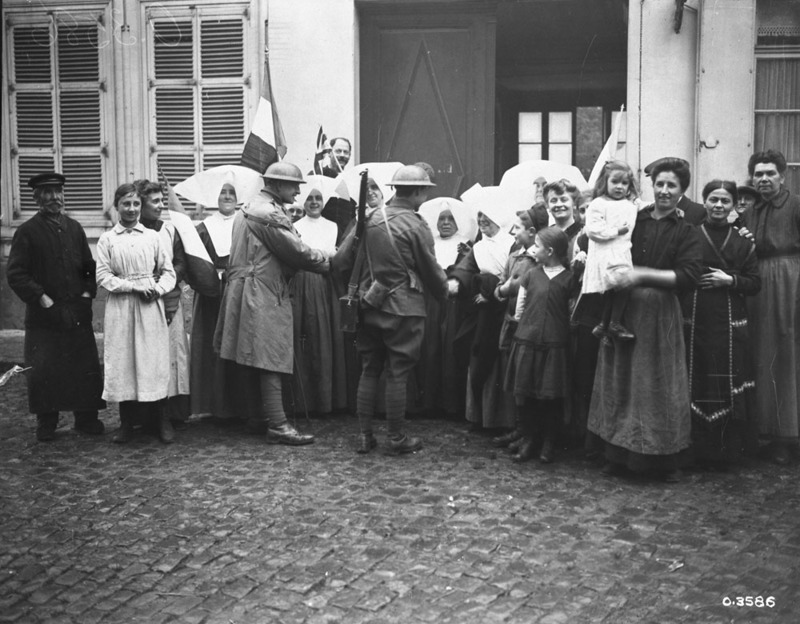 Later, Cairns and another soldier were patrolling the city when they entered a courtyard and found 50 German soldiers. While in the process of taking them prisoner and confiscating their weapons, a German officer grabbed for his pistol and shot Cairns through the stomach. In retaliation, Cairns opened fire, killing or wounding about 30 German soldiers. The would-be German prisoners, realizing they needed to fight for their lives, descended upon Cairns and opened fire. Cairns was shot through the wrist, but continued to fire his Lewis gun at the enemy. He was again shot through the hand, nearly taking it off, and breaking his Lewis gun. Cairns threw the useless gun in the face of a German soldier who was firing at him, knocking him over. With his remaining strength, Cairns staggered to a gateway and collapsed, where he was carried off by his comrades. 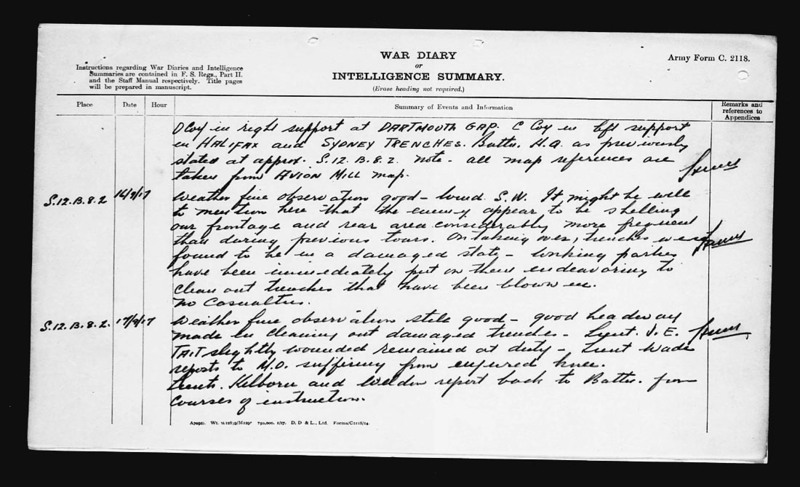 Cairns’ heroic maneuvers and self-sacrifice are detailed in the 46th Battalion’s war diaries for November 1918 (pp. 21, 22, 23), where he is mentioned by name throughout the whole account. He is one of several names given special recognition for his actions in Valenciennes. His efforts and bravery helped his company achieve their objectives. By the end of the day, the Canadian Corps captured approximately 1,800 German soldiers and killed more than 800 men. The Canadian losses including Cairns were 80 killed, and approximately 300 wounded. Cairns died of his wounds on November 2, 1918 and was awarded the Victoria Cross posthumously. Cairns is buried at Auberchicourt British Cemetery in Nord, France. Several dedications have been made in his memory, honouring his gallantry. The town of Valenciennes renamed one of its main streets to Avenue du Sergent Cairns. His parents travelled to France to attend the civic ceremony held on July 25, 1936. Back in Canada, an elementary school is named after him, Hugh Cairns V. C. School, in Saskatoon, Saskatchewan. The 38 Combat Engineer Regiment armoury in Saskatoon bears his name, Sgt. Hugh Cairns VC Armoury. His Victoria Cross is on display at the Canadian War Museum in Ottawa, Ontario. 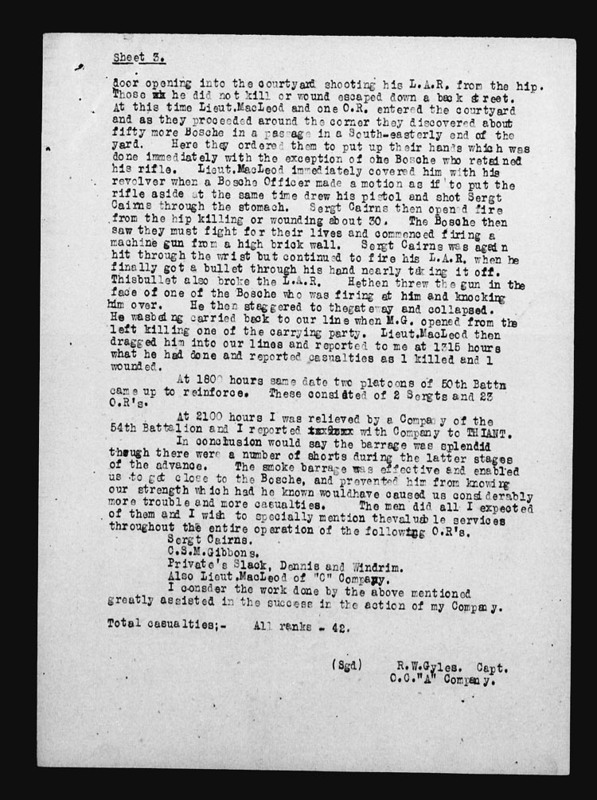 Library and Archives Canada holds the digitized service file of Sergeant Hugh Cairns. Ashley Dunk is a project assistant in the Online Content Division of the Public Services Branch of Library and Archives Canada. In Library and Archives Canada’s Victoria Cross blog series, we profile Canada’s Victoria Cross recipients on the 100th anniversary of the day they performed heroically in battle, for which they were awarded the Victoria Cross. 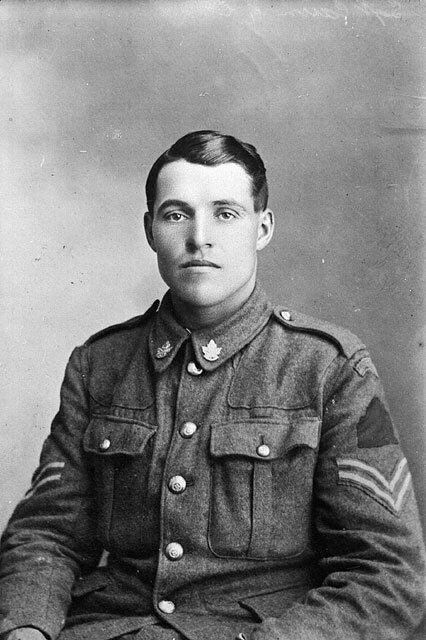 Today, we remember Newfoundland’s Private Thomas Ricketts and his selfless bravery demonstrated at Ledeghem, Belgium. At the outbreak of the First World War in 1914, Newfoundland was a dominion of the British Empire. In order to support the British Army and war effort, Newfoundland recruited a volunteer army, garnering enough men to outfit and sustain a battalion throughout the entirety of the war. Two additional battalions were later added: the 2nd Reserve Battalion, mostly stationed at Ayr, Scotland, and the 3rd Battalion, responsible for recruiting and training in St. John’s. In 1917, in recognition of their courageous actions and heroic participation during the battles of Ypres and Cambrai in France, King George V bestowed the regiment with the prefix “Royal”. 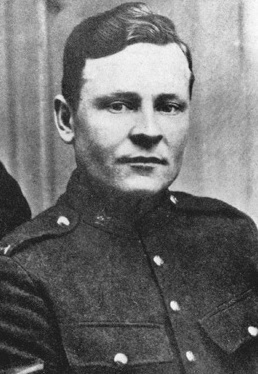 Born in Middle Arm, White Bay, Newfoundland, on April 15, 1901, to John and Amelia (Cassels) Ricketts, Thomas Ricketts enlisted with the 1st Battalion, Newfoundland Regiment, on September 2, 1916. He was underage—only 15 years old—when he volunteered, but claimed to be 18 on his attestation papers. His deception went unnoticed and he was accepted. He embarked for England with the British Expeditionary Force (BEF) and during his service was shot in the leg in November 1917. 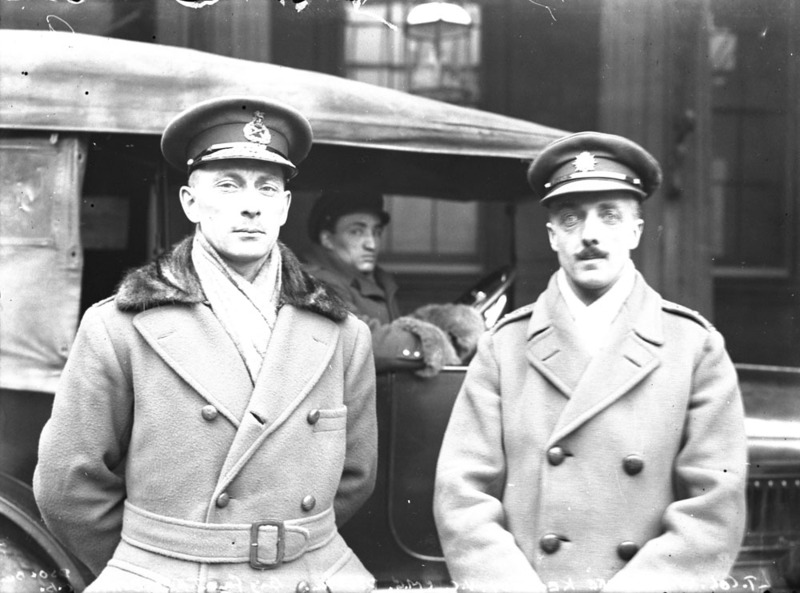 Ricketts returned to his regiment in the spring of 1918, after recovering. On October 14, 1918, the 1st Battalion was participating in the advance from Ledeghem, east of Ypres, in Belgium. The regiment had been fighting through rolling smoke and mist to push back the Germans and capture enemy pillboxes and weapons. By mid-morning, the mist had burned off, revealing a stream, the Wulfdambeek. Forced to cross it, the regiment was exposed to enemy fire. They suffered heavy casualties and soon after were pinned down by enemy shelling. Unable to call on their own artillery fire to combat the German shelling, the only solution was to disable the enemy battery and weapons and to kill the enemy soldiers. Ricketts volunteered to run forward with his section commander, toting a Lewis machine gun in an effort to outflank the battery. They rushed forward in short advances under heavy machine gun fire, and soon ran out of ammunition, still 300 yards away from the battery. The Germans saw an opportunity to move up their gun teams to take out the advancing pair while they were vulnerable. Ricketts realized the situation and retreated 100 yards under debilitating machine gun fire to retrieve more ammunition. Upon his return with additional resources, he adeptly handled the Lewis gun, driving the enemy and gun teams back to a nearby farm. With the threats removed, the platoon advanced without casualties and captured four field guns, four machine guns, and eight prisoners. Later, a fifth gun was intercepted and captured. By his presence of mind in anticipating the enemy intention and his utter disregard for personal safety, Pte. Ricketts secured the further supply of ammunition which directly resulted in these important captures and undoubtedly saved many lives. Ricketts survived the remainder of the war and was discharged on June 17, 1919, for demobilization. He was invested with the Victoria Cross by King George V on January 19, 1919, at Sandringham, England, when he was only 17 years old, the youngest Victoria Cross army combatant recipient. He returned to Newfoundland a war hero. Upon his return home, he returned to school and later became a pharmacist. In addition to his Victoria Cross, Ricketts was also awarded the French Croix de Guerre with Golden Star for his gallantry. He died in St. John’s, Newfoundland, on March 21, 1967. Rickett’s Victoria Cross and Croix de Guerre is on display at the Canadian War Museum in Ottawa, Ontario. 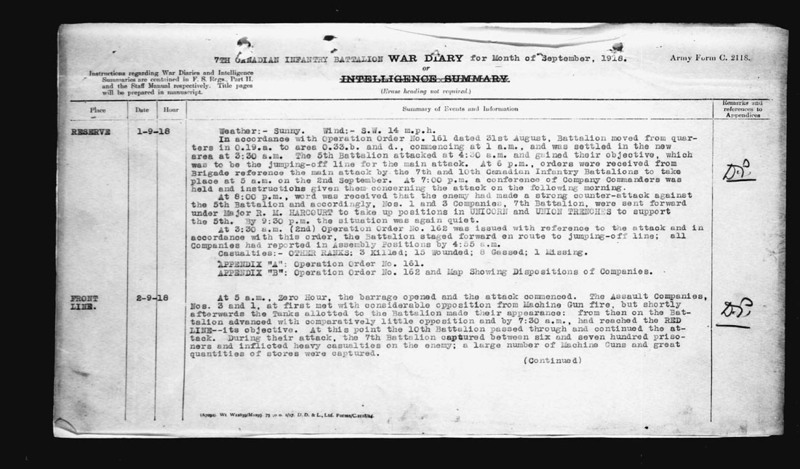 Library and Archives Canada holds the digitized service file for Private Thomas Ricketts. You can tag the images in this blog! Immerse yourself in the CEF digitized files and transcribe, tag, translate and describe their content. Every addition to a record becomes new metadata, searchable within 24 hours, helping LAC’s records become more “discoverable” day after day. Visit the blog article explaining how you can give a hand to history! Ashley Dunk was a project assistant in the Online Content Division of the Public Services Branch of Library and Archives Canada. In Library and Archives Canada’s blog series on Canadian Victoria Cross recipients, we profile Canada’s Victoria Cross recipients on the 100th anniversary of the day that the actions took place for which they were awarded the Victoria Cross. Today we commemorate two Canadian soldiers awarded the Victoria Cross for their actions on September 27, 1918, during the campaign for the Canal du Nord and Bourlon Wood, France. The Canadians Corps opened their initial attacks during the Battle of Scarpe on August 26, 1918, to ultimately crash through the heavily fortified Drocourt-Quéant Line on September 2nd. The over eight kilometres gained by the Corps resulted in high casualties amongst officers and soldiers alike. Following this offensive, it was strategized for the Canadians, with assistance of other battalions from the Allied forces, to capture the Canal du Nord and open the roads to Cambrai. 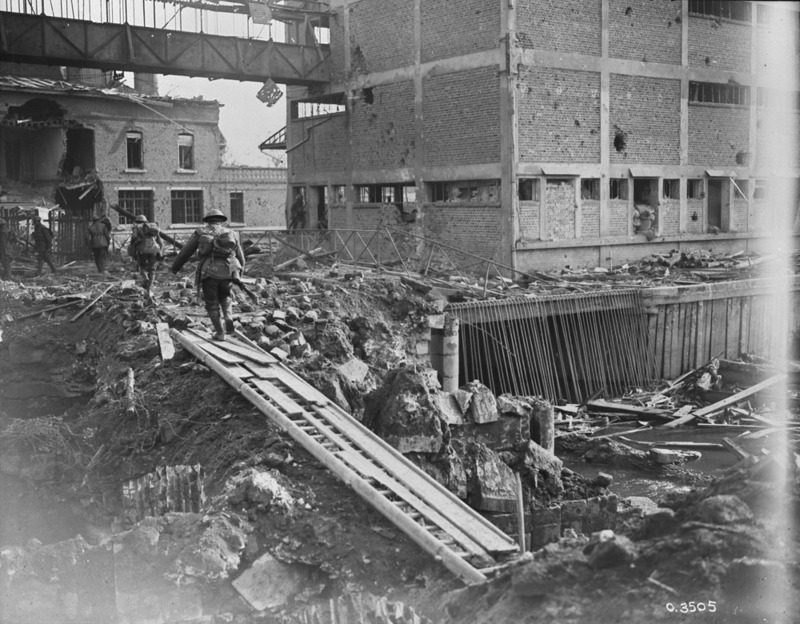 The retreating Germans destroyed several bridges along the canal, leaving a few well defended for their own use, and no possibility for the Canadian arm to establish outposts on the other side of the canal. After a month of planning and rebuilding bridges, the Canadian Corps were ready to conquer their next objective: Canal du Nord and Bourlon Wood. It is during the Battle of Canal du Nord that two Canadian soldiers would perform heroic feats and earn one of the highest military commendations. Born on June 8, 1894, in Deseronto, Ontario, George Fraser Kerr was a chemist before the outbreak of war. On September 22, 1914, at 20 years of age, he enlisted at Valcartier, Quebec, joining the 3rd Battalion of the Canadian Expeditionary Force (CEF) as a private. After proving himself repeatedly in battle, he was commissioned as an officer on July 1, 1917, eventually rising to the rank of captain. 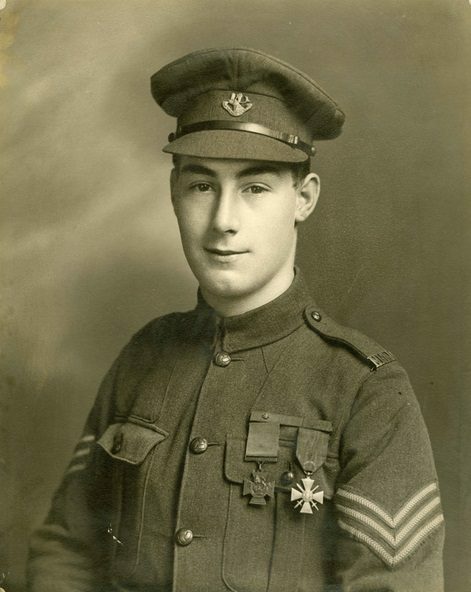 He was a decorated soldier, earning a number of commendations: the Military Medal on August 23, 1916, for his courageous actions on Mount Sorrel; the Military Cross on December 2, 1918; and a bar for the Military Cross on January 2, 1919, for his gallantry and initiative during the Drocourt-Quéant attack from September 2 to 3, 1918. On September 27, 1918, at 5:20 a.m., Canadian artillery pounded German positions in preparation for attack on Canal du Nord, with an objective to push through the German line. At 6:00 a.m., Kerr, serving with the 3rd Battalion, was in command of the left support company. While on the campaign to take Bourlon Wood and under heavy machine-gun fire, he showed great skill by outflanking a machine gun that was hindering the advance. After advancing past Canal du Nord and pushing ahead, the advance was held up by a strong point near the Arras-Cambrai road. Kerr was ahead of his company and rushed to the German strong point. He single-handedly captured four machine guns and thirty-one prisoners, allowing the advance to continue until the company was held up just beyond Bourlon Wood. After being wounded twice in action, as well as in an incident in which he fell from his horse after the Armistice, Kerr was discharged as medically unfit on July 16, 1919. Kerr died on December 8, 1929. Today his Victoria Cross is on display at the Canadian War Museum. 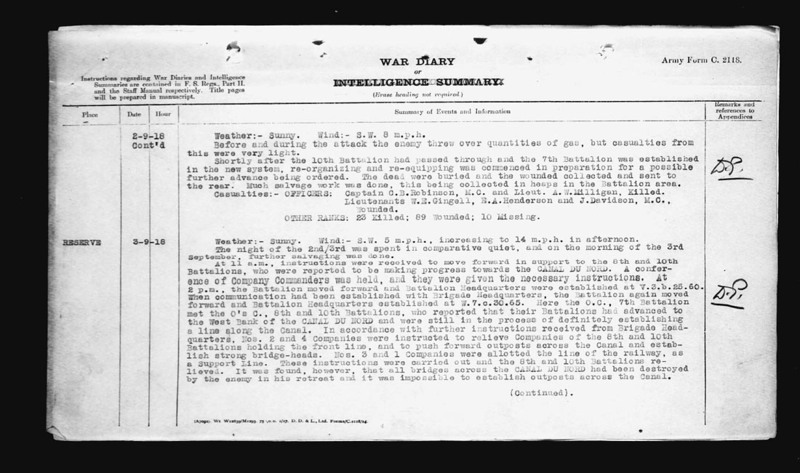 Library and Archives Canada holds the digitized service file of Lieutenant George Fraser Kerr. Born in Manchester, England on March 8, 1892, Lyall immigrated to Canada and settled in the Niagara Region where he worked as a mechanical engineer. 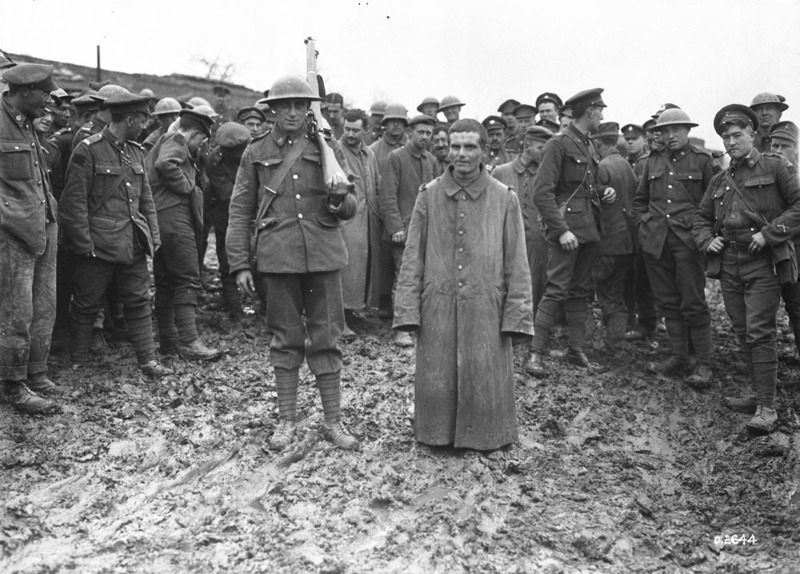 He joined the 19th Regiment of the British militia before enlisting on September 24, 1915, at St. Catharines, Ontario with the 81st Battalion of the Canadian Expeditionary Force (CEF). Later, he would transfer to the 102nd Battalion, Canadian Infantry. On the same day that George Fraser Kerr was leading his company toward Bourlon Wood, Lyall was serving in the 102nd Battalion, leading his platoon. The leading company was held up at a strong point, battling rapid machine-gun fire from the German position. With the support of Kerr and his platoon, Lyall and his company captured the point with a flank movement, staying back to weaken the enemy forces at the point with less offensive power. Because of this maneuver, he detained thirteen prisoners, one field gun, and four machine guns. Later, his platoon, weakened by casualties, was held up by machine guns at the southern end of Bourlon Wood. With the available men, Lyall moved toward the strong point. Rushing the position single-handedly ahead of his platoon, Lyall killed the officer in charge. His bravery awarded them forty-five prisoners and five machine guns. Lyall, achieving his objective and capturing an additional forty-seven prisoners, re-established his position, protecting the remainder of the company. Later, on October 1, 1918, in the neighbourhood of Belcourt and commanding a diminished company, he captured a strongly defended position, producing eighty prisoners and seventeen machine guns. During two days of operations Lieutenant Lyall captured in all 3 officers, 182 other ranks, 26 machine guns, and one field gun, exclusive of heavy casualties inflicted. He showed throughout, the utmost valour and high powers of command. The Canadian Corps achieved and exceeded their objectives on September 2, 1918, advancing further than expected under heavy machine-gun fire and terrible casualties. By the end of the day, they took Bourlon Wood, capturing the Red, Blue, and Green Lines. 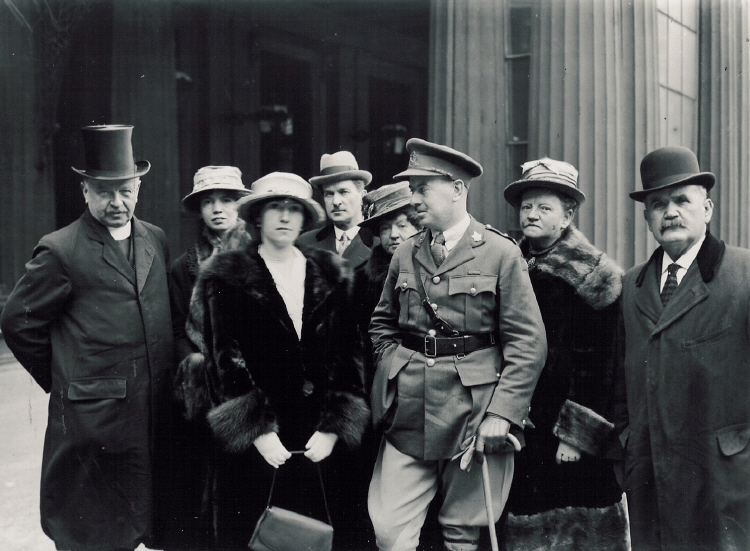 After the Armistice, Lyall sailed for England in 1919, where he would enlist in the British Army. He died on November 28, 1941, during the Second World War on a campaign in Egypt. A plaque commemorates his acts of valour in the Lincoln and Welland Regiment memorial garden in St. Catharines, Ontario. Library and Archives Canada holds the digitized service file of Lieutenant Graham Thomson Lyall. Library and Archives Canada’s blog series on Canadian Victoria Cross recipients remembers soldiers on the 100th anniversary of the day they acted bravely in battle and for which they were awarded the Victoria Cross. Today we commemorate the courageous actions of Private Walter Leigh Rayfield. Born on October 7, 1881 in Richmond, England, Rayfield immigrated to Canada before the war. He worked as a lumberjack before enlisting on July 10, 1917 at Victoria, British Columbia, joining the 7th Infantry Battalion of the Canadian Expeditionary Force (CEF). At the beginning of September 1918, the Canadian Corps was making efforts to break through the six-kilometer front known as the Drocourt-Quéant Line, east of Arras, France. Having taken the enemy strong point, the Crow’s Nest, on September 1, 1918, the Corps needed an intense assault to break through the German lines and head toward the Canal du Nord. At 5:00 a.m. on September 2, 1918, Canadian artillery fire rained down in a barrage over enemy positions, enabling the Canadians to advance. Tanks provided supporting offensive fire, and by 7:30 a.m., troops reached the Red Line and the village of Dury. During this advance, Rayfield found himself ahead of his company. He rushed a trench occupied by a party of enemy soldiers, killed two soldiers with his bayonet, and took ten men prisoner. He then rushed the section of trench from which the sniper had been operating, and so demoralised the enemy by his coolness and daring that thirty others surrendered to him. He acted again without regard for his personal safety when he left cover under heavy machine gun fire and carried a badly wounded comrade to safety. Rayfield was lauded for his courage, bravery, and initiative during these assaults. Through gas attacks, rapid machine gun fire, and direct attacks from enemy rifles, Rayfield performed gallantly in battle, and heroically for the benefit his comrades. 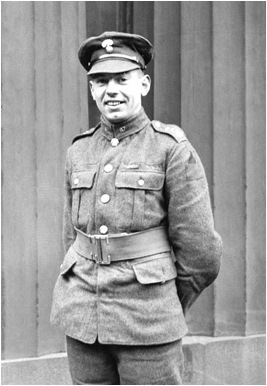 Rayfield was awarded the Victoria Cross for his actions from September 2 to 4, 1918, in Arras. He survived the war and was discharged on April 25, 1919. Rayfield died on February 20, 1949. Today his Victoria Cross is on display at the Canadian War Museum. 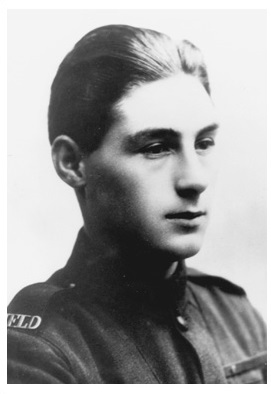 Library and Archives Canada holds the digitized service file of Private Walter Leigh Rayfield. Bellenden Seymour Hutcheson was born at Mount Carmel, Illinois, on December 16, 1883. He studied medicine at Northwestern University near Chicago and worked as a doctor. Hutcheson was physically striking—he had white hair and piercing blue eyes. Like many Americans, Hutcheson decided to fight for Canada. On November 6, 1915, he joined the Canadian Army Medical Corps at Hamilton, Ontario, and was assigned to the 75th Battalion. For his bravery in another action, Hutcheson received the Military Cross. Dr. Hutcheson married a woman from Nova Scotia at the end of the war and returned to his medical practice in Illinois. He visited Canada regularly over the years, and took part in battalion reunions, but he rarely spoke about his wartime experiences. He died in Cairo, Illinois, on April 9, 1954. His Victoria Cross is held by the Toronto Scottish Regiment Museum. “VC from Illinois modestly declines to details exploits,” The Globe and Mail, March 6, 1930, p. 13. “‘Six-bits’ reunion is first since war,” The Globe and Mail, April 13, 1931, p. 14. Arthur George Knight was born at Haywards Heath, England, on June 26, 1886. In 1911, he immigrated to Canada and worked as a carpenter. He joined the Canadian Expeditionary Force in December 1914 and served with the 10th Battalion. He was awarded the Belgian Croix de Guerre in November 1917. Knight was badly wounded in this fighting and died the following day. His Victoria Cross is held by Calgary’s Glenbow Museum. Metcalf died at Lewiston, Maine, on August 8, 1968. His Victoria Cross is held by the Canadian Scottish Museum, Victoria, BC. Cyrus Wesley Peck was born at Hopewell Hill, New Brunswick, on April 26, 1871. He trained to be a soldier, but was unsuccessful in taking part in the South African War. At the start of the First World War, Peck was managing a salmon cannery in British Columbia and serving in the militia. 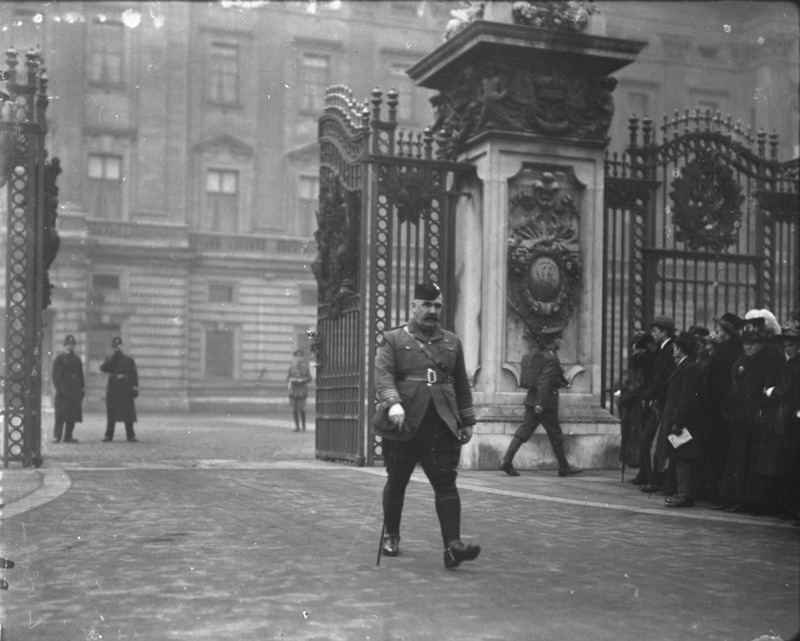 He enlisted in the 30th Battalion on November 8, 1914, at the rank of Major. 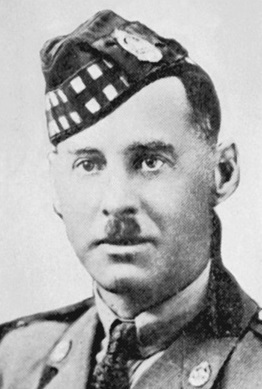 In late 1916, Peck was promoted to Lieutenant-Colonel and given command of the 16th Battalion, the Canadian Scottish Regiment. Peck received the Distinguished Service Order, was mentioned in dispatches five times, and was wounded twice. He was also elected to the House of Commons for the riding of Skeena, British Columbia, in the federal election of December 1917. This so-called “Khaki Election” was the first one in which soldiers on active service were allowed to vote. 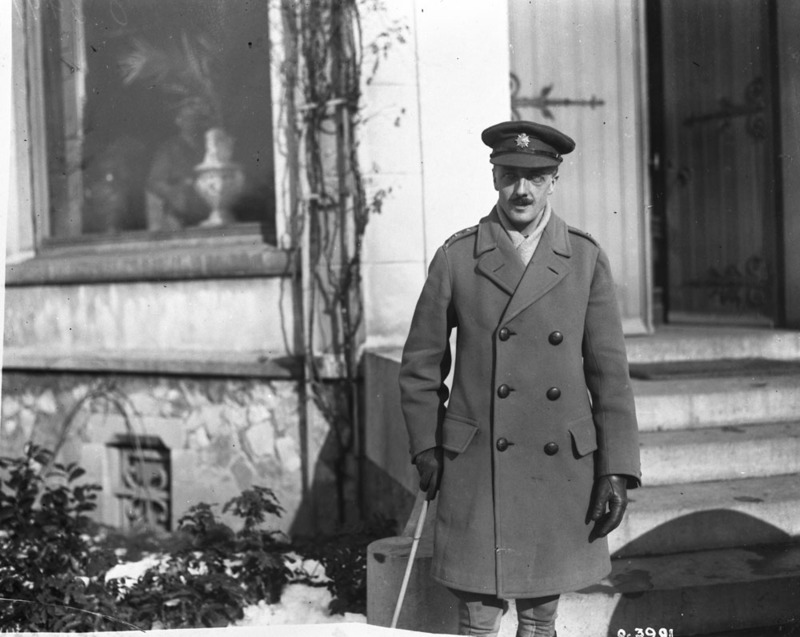 Though Peck was now a Member of Parliament, he continued to carry out his military duties in France. Peck lost his seat in the House of Commons in the 1921 federal election. He sat in British Columbia’s provincial legislature from 1924 to 1933, and died at Sydney, British Columbia, on September 27, 1956. His Victoria Cross is held by the Canadian War Museum. “Won VC in 1918 while a member of parliament,” The Globe and Mail, September 28, 1956, p. 7. John Francis Young was born in Kidderminster, England, on January 14, 1893, and immigrated to Canada sometime before the war. He enlisted in the 87th Battalion at Montreal on October 20, 1915, and served as a stretcher bearer. 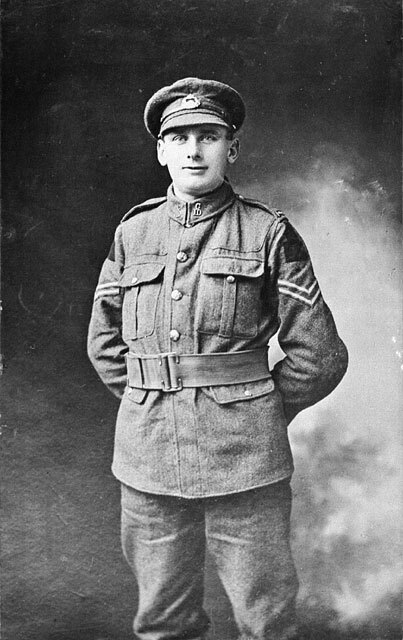 Young was wounded at the Somme in November 1916. Young was gassed in a subsequent battle and suffered permanent and debilitating lung damage. He died at Sainte-Agathe-des-Monts, Quebec, on November 7, 1929. His Victoria Cross is held by the Canadian War Museum. “John F. Young, VC, is dead in Quebec,” The Globe and Mail, November 8, 1929, p. 1. Library and Archives Canada holds the service files for Bellenden Seymour Hutcheson, Arthur George Knight, William Henry Metcalf, Cyrus Wesley Peck and John Francis Young. Andrew Horrall is a senior archivist in the Private Archives Division at Library and Archives Canada. When Claude Joseph Patrick Nunney joined the 38th Battalion on March 8, 1915, he stated that he was born in Dublin, Ireland, on December 24, 1892. This appears not to have been strictly true, though it is unclear why Nunney obscured his origins. Archival records point to Nunney having been born on that day in Hastings, England, and given the name Stephen Sargent Claude Nunney. It is certain that he was orphaned as a child and sent across the Atlantic to Ottawa, where he was adopted at first by Mrs. D. J. MacDonald, of North Lancaster, Ontario. By the time he enlisted, he was living with the Calder family of Glengarry County, Ontario, whom he identified as his next of kin and to whom he remitted money each month. Nunney was an outstanding soldier who was awarded the Distinguished Conduct Medal for his actions at the Battle of Vimy Ridge in April 1917, when “although wounded in two places and his section wiped out he continued to advance carrying his gun and ammunition and alone stopped an attack by over 200 enemy. He continued on duty for three days showing exceptional fearlessness and doing magnificent work.” (London Gazette, no. 30234, 16 August 1917) Soon afterwards, he was awarded the Military Medal for another act of bravery. Nunney was severely wounded while carrying out these courageous acts and died on September 18, 1918. He left all his effects, including his medals, to the Calders. When Canadian Victoria Cross recipients assembled at Toronto in 1938, the widowed Mrs. Calder was too old to attend. So she asked a female friend in Alexandria, who was an advocate for veterans’ welfare, to wear Nunney’s medals at the gathering. The orphaned Irish boy had been adopted by an entire community. His Victoria Cross is held by the Cornwall Armoury. Library and Archives Canada holds his service file. “Spirit of war hero marches on in VC,” The Globe and Mail, August 2, 1938, p. 5. William Hew Clark-Kennedy was born in Dunskey, Scotland, on March 3, 1880, and began working for the Standard Life Assurance Company at age 16. He served with a British cavalry regiment in the South African War before moving to Canada in 1902 to work in Standard Life’s Montreal office. There he met and married Katherine “Kate” Reford. Clark-Kennedy joined the 13th Battalion, Royal Highlanders of Canada, at Valcartier, Quebec, on September 23, 1914, and arrived in France the following February. 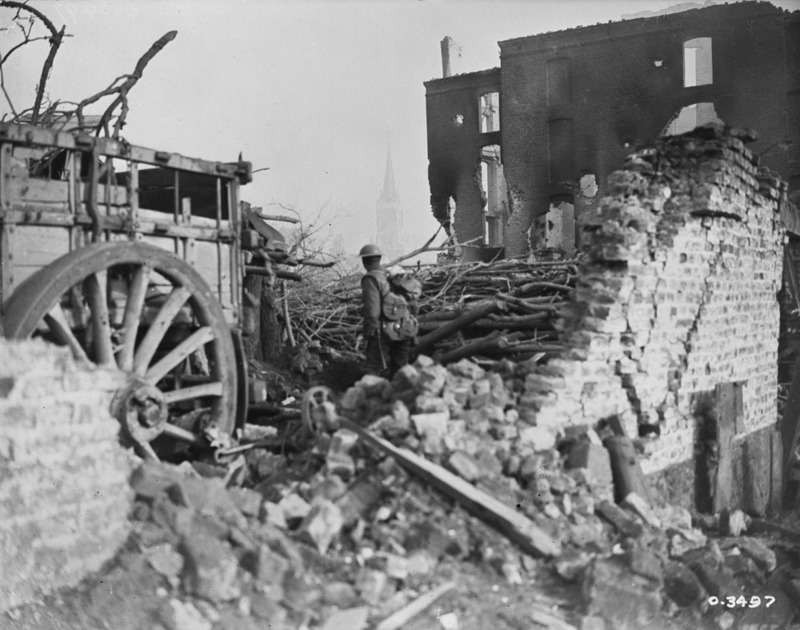 On April 24, 1915, an artillery shell landed near where he and two other men were standing. Clark-Kennedy’s companions were killed instantly, while he was buried by earth and mud. Clark-Kennedy’s comrades believed that he also had died and that his body had been either obliterated or buried. They reported that he had been killed in action. But Clark-Kennedy had suffered only minor injuries, and without anyone noticing, he dug himself out and resumed fighting. It took a couple of days to sort out the error and for Clark-Kennedy to cable his family and tell them he was fine. 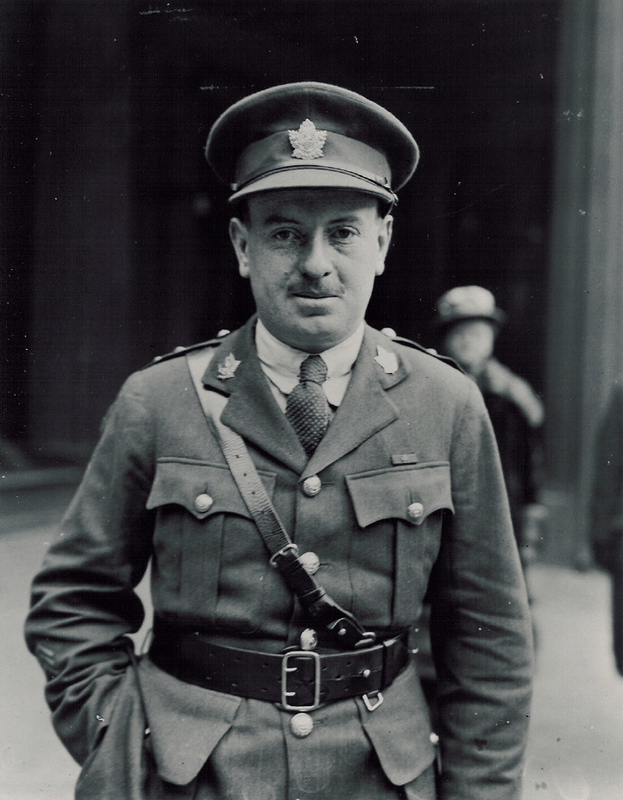 In addition to the Victoria Cross, Clark-Kennedy was mentioned in despatches four times, received the Distinguished Service Order twice, was appointed a Companion of the Order of St Michael and St George, and was awarded the French Croix de Guerre. After the war, Clark-Kennedy returned to Canada and his job at Standard Life, and eventually became the firm’s director. He died in Montreal on October 25, 1961. Clark-Kennedy’s Victoria Cross is held by his family. Library and Archives Canada holds his service file. “Officer, feared dead, continued to fight,” The Globe and Mail, October 27, 1961, p. 31. “Lt.-Col. Clark-Kennedy VC, dies here in 83rd year,” Montreal Gazette, October 27, 1961, p. 4. In Library and Archives Canada’s Victoria Cross blog series, we profile Canada’s Victoria Cross recipients on the 100th anniversary of the day that they performed valiant actions for which they were awarded the Victoria Cross. Today we commemorate Sergeant Robert Spall, whose valiant actions and self-sacrifice on August 12 and 13, 1918 earned him the Victoria Cross. Born in Ealing, Essex, England on March 5, 1890, Spall immigrated to Canada with his parents and settled in Winnipeg, Manitoba. He was a customs broker before the war and was a member of the Active Militia. 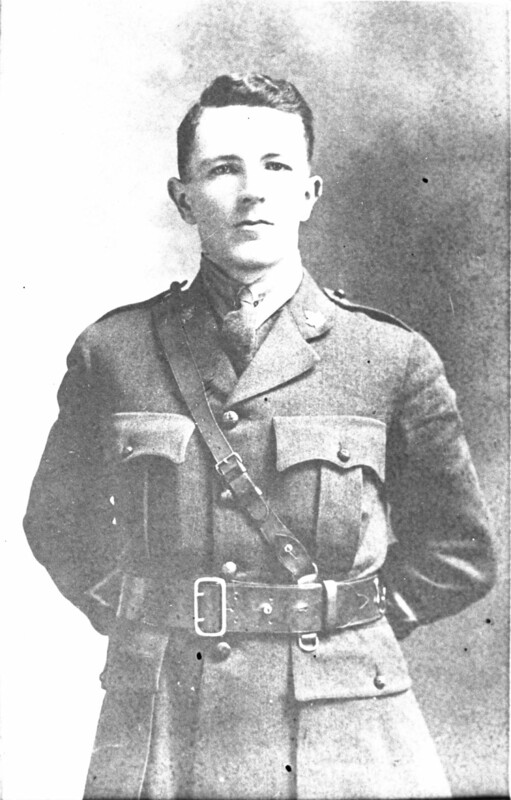 On July 28, 1915, Spall enlisted in Winnipeg, joining the 90th Battalion of the Canadian Expeditionary Force (CEF). 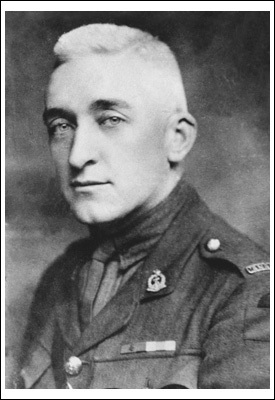 He arrived in France with the Winnipeg Rifles on February 13, 1916 at age 26. Later, the 90th Battalion would be absorbed by the 11th Reserve Battalion to provide reinforcements to the Canadian Corps. Eventually, Spall ended up in the Princess Patricia’s Canadian Light Infantry (PPCLI). On August 12, 1918, German shells rained down on the PPCLI, the 116th Canadian Battalion, and the 42nd Canadian Battalion, keeping them in their respective trenches. 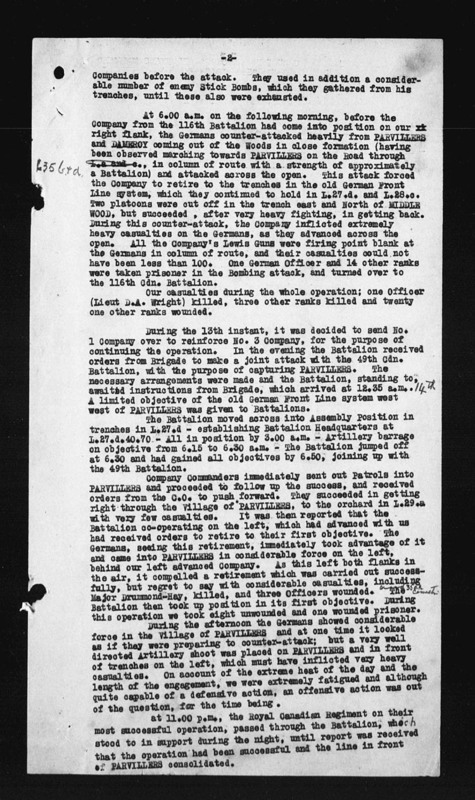 Their objective was handed down at noon; in conjunction with the 42nd Battalion, PPCLI was to push the Germans out of Parvillers from the south. The plan was to move up to posts south of Parvillers held by the 9th Canadian Infantry and use them as jumping off points, while simultaneously bombing the trenches of the old German front line system and the trenches leading into Parvillers. However, when the Company arrived at their assigned positions, it was discovered that the 9th Infantry did not control those points, and were still in the hands of the Germans. Despite the setback, the attack was to be carried out. At 8:00 p.m., the Canadians were met with heavy resistance, with little progress being made. Casualties were heavy on the German side as the Company pushed forward, with a bombing section moving down the German trench. At 6:00 a.m. on August 13, 1918, the Germans counter-attacked heavily from Parvillers and Damery, coming out of the woods in a tight formation and attacking across the open. This sudden and vigorous attack forced the Company to retreat and head for the old German front line. In the mayhem, two platoons were cut off from the Company. It is likely that Spall participated in this attack, and was instrumental in releasing his platoon from their locked position. Isolated with his platoon from the rest of the Company, Spall mounted the parapet armed with a Lewis automatic machine gun and fired directly at the oncoming German soldiers. He returned to the trench to motion to his platoon to move into a nearby sap 75 yards away from the enemy. He climbed back atop the parapet once more and continued his assault. It was at this time he was shot and killed. His insurmountable bravery and self-sacrifice allowed his men to rejoin the others, and his resourcefulness with the Lewis gun resulted in heavy German casualties. 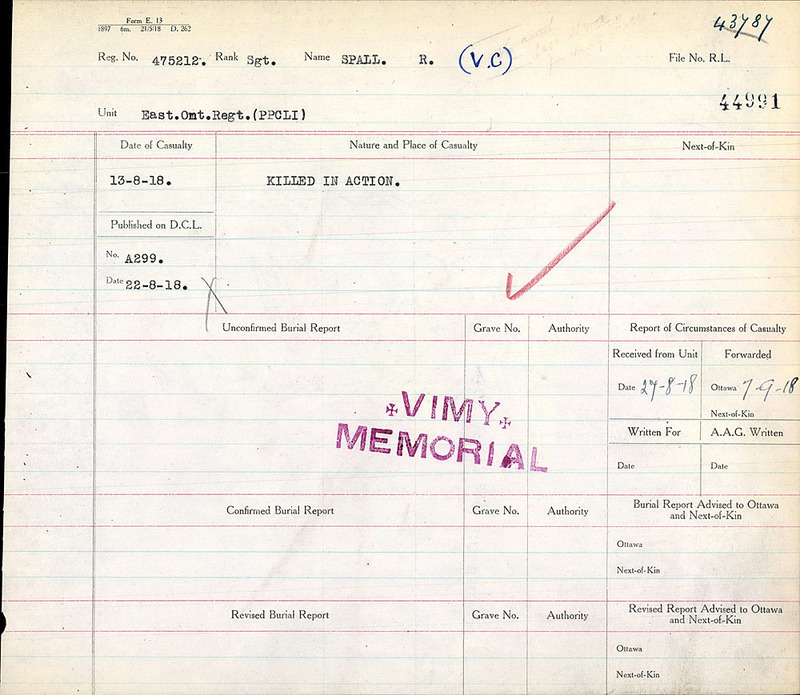 Sergeant Robert Spall’s Commonwealth War Graves Register, Vol. 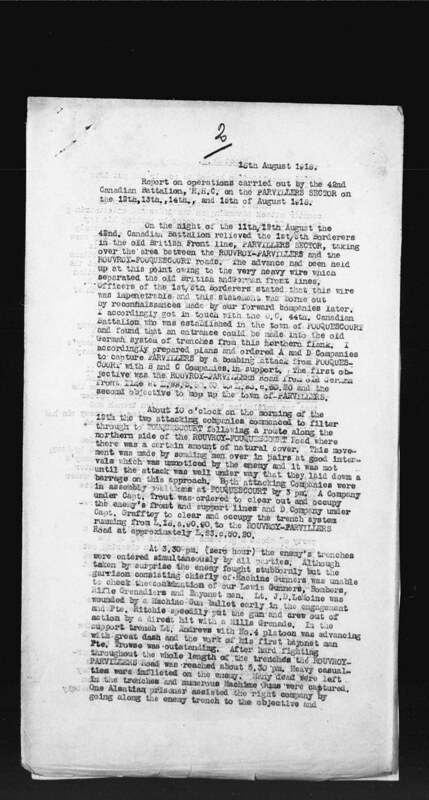 31830_B034454, Page 845, August 22, 1918. …during an enemy counter-attack, his platoon was isolated. Thereupon Sjt. Spall took a Lewis gun and standing on the parapet fired upon the advancing enemy, inflicting very severe casualties. He then came down the trench directing the men into a sap seventy-five yards from the enemy. Picking up another Lewis gun, this gallant N.C.O. again climbed the parapet, and by his fire held up the enemy. It was while holding up the enemy at this point that he was killed. Sjt. Spall deliberately gave his life in order to extricate his platoon from a most difficult situation, and it was owing to his bravery that the platoon was saved. Spall’s body was never recovered and he is commemorated on the Vimy Memorial. His name can also be found on the cenotaph in Barrie Military Heritage Park. Library and Archives Canada holds the digitized service file of Sergeant Robert Spall. In Library and Archives Canada’s Victoria Cross blog series, we profile Canada’s Victoria Cross recipients on the 100th anniversary of the day they performed heroically in battle, and were awarded the Victoria Cross. Today, we remember Lieutenant Thomas Dinesen and his bravery during the Battle of Amiens in France on August 12, 1918. Born on August 9, 1892 to an affluent and aristocratic family in Rungsted, Denmark, Thomas Fasti Dinesen was a civil engineer when he tried on multiple occasions to enlist with armies from various countries. He was unsuccessful in joining the French Army, the British Army, and the American Army. On June 26, 1917, he successfully enlisted with the 2nd Reinforcing Company of the Canadian Expeditionary Force (CEF). 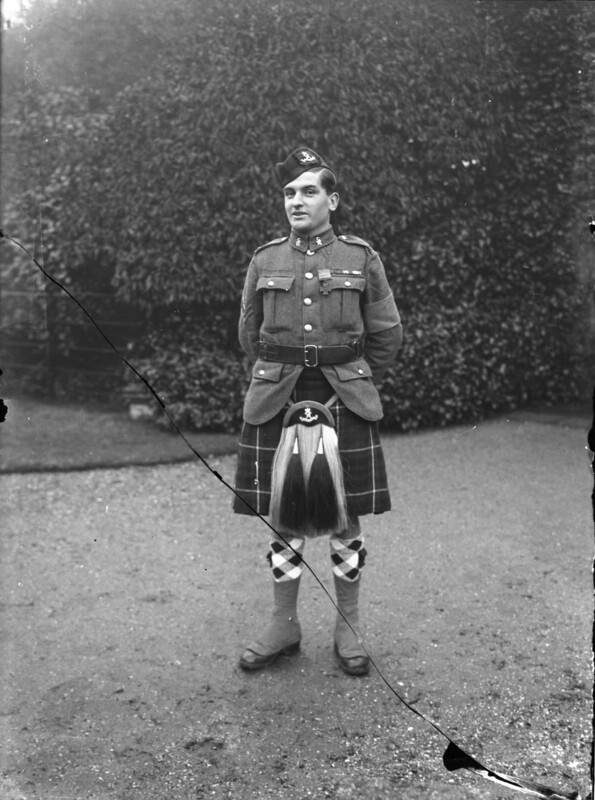 Dinesen served in the 20th Reserve Battalion before his transfer to the 42nd Battalion Royal Highlanders, known as the Black Watch of Canada. On the night of August 11 to early August 12, 1918, the 42nd Battalion was sent in as relief to the old British front line, Parvillers sector, France. The Allied advance had been held up at this point due to impenetrable barbed wire separating the old British and German front lines. The objective was to take Parvillers by a bombing attack and capture the well-defended German trench. Around 10 o’clock on the morning of August 12, men were sent over to the jumping-off point along the northern side of the Rouvroy-Fouquescourt road in pairs at varying intervals to go unnoticed by the enemy. Only after the attack was well underway did the Germans try to hinder the approaching Canadians with a barrage. 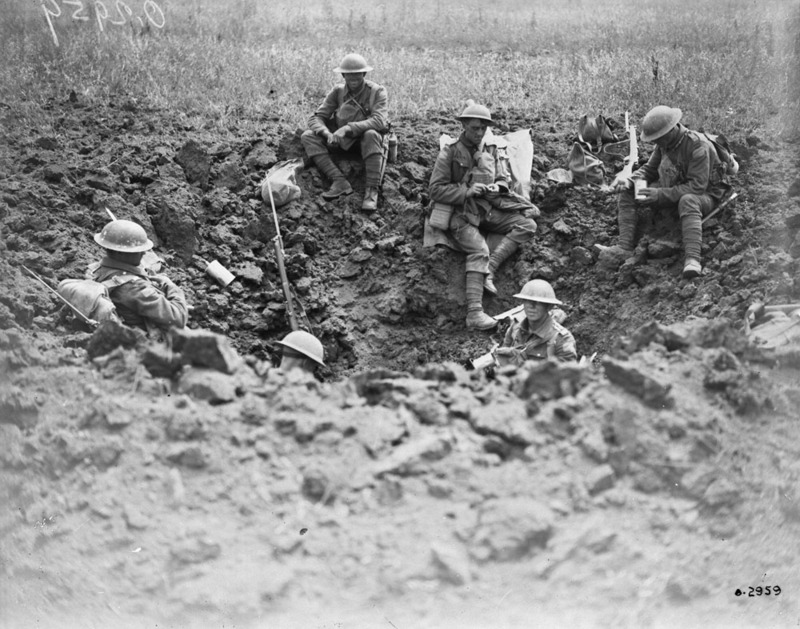 By mid-afternoon, Canadian soldiers simultaneously entered the enemy trenches, and they were met with counter-attacks. The Canadians inflicted heavy German casualties and captured several machine guns. 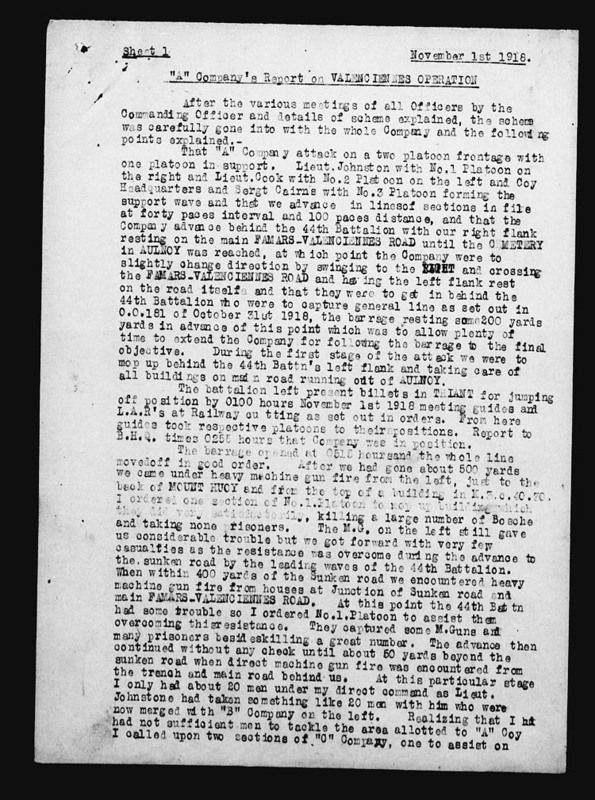 War diary appendix from the 42nd Canadian Infantry Battalion detailing the offensive on August 11–12, 1918, p. 26 (e001110175). It was during this Allied offensive known as the Battle of Amiens that Dinesen earned his Victoria Cross as a private. On the last day of the battle, he rushed forward and single-handedly through heavy German counter-attacks and put hostile machine guns out of action. Engaging in hand-to-hand combat with his bayonet and bombs, Dinesen killed 12 enemy soldiers. His vigorous efforts over 10 hours resulted in the successful capture of more than 1.5 kilometres of fiercely defended German trenches at Parvillers. In recognition for his gallantry, the French government awarded Dinesen the Croix de Guerre. Later he was commissioned as an officer in November 1918, eventually rising to the rank of lieutenant. Canadians resting in a shell hole made by their own artillery, August 1918 (a002859). He died in Leerbaek, Denmark on March 10, 1979. 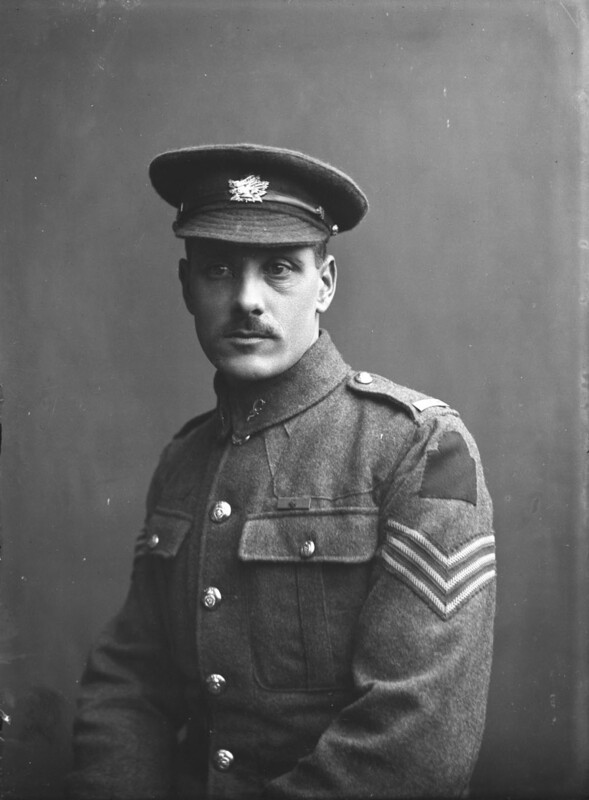 His Victoria Cross is on display in the Ashcroft Gallery of the Imperial War Museum. After the war, Dinesen wrote and published a number of books in Danish, including a memoir about his experience trying to enlist, as well as the events that earned him the Victoria Cross titled, No Man’s Land: En Dansker Med Canadierne Ved Vestfronten. In 1930, it was translated into English under the title Merry Hell! : A Dane with the Canadians. A copy of the English translation can be consulted on-site at Library and Archives Canada. 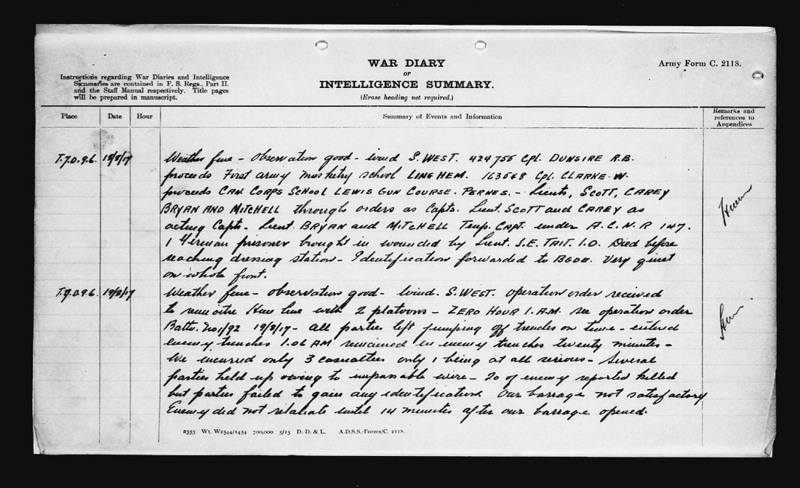 Library and Archives Canada holds the digitized service file of Lieutenant Thomas Dinesen. 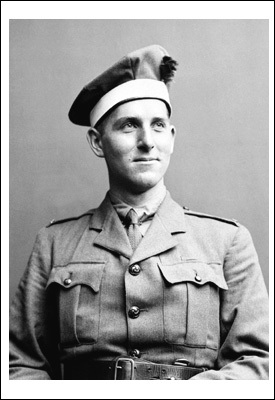 Today on the blog series commemorating Canadian Victoria Cross recipients, we remember Lieutenant James Edward Tait, who was awarded the Victoria Cross one hundred years ago, in August 1918, for his actions on the battlefield in France. Born on May 27, 1888, in Dumfries Scotland, James Edward Tait later immigrated to Winnipeg, Manitoba. Prior to the war, he was a civil engineer who was active in the 100th Winnipeg Grenadiers as militia. He also had prior military service, having served five years in the Imperial Yeomanry, four years in the Regimental Scouts and one year in a unnamed squadron. Tait enlisted in the 100th Battalion of the Canadian Expeditionary Force on January 22, 1916. He transferred to the 78th Battalion in the winter of 1917. He was wounded twice in 1917, on April 1 and September 16, and then again on April 21, 1918. On August 16, 1917, he was awarded the Military Cross. Later that day, however, Tait was mortally wounded by a German shell. Nevertheless, he continued to give orders and rally his men until he died. Tait is buried in the Fouquescourt British Cemetery near the Somme, France. Today, Tait’s Victoria Cross is at the Glenbow Museum in Calgary. 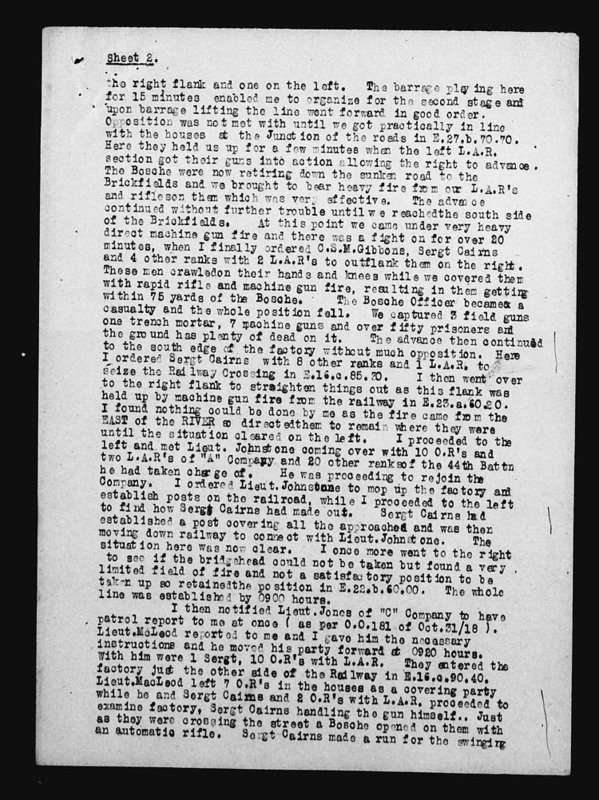 Library and Archives of Canada holds the digitized service file of Lieutenant James Edward Tait. John Morden is an honours history student from Carleton University doing a practicum in the Online Content Division at Library and Archives Canada.